The British Oceanographic Data Centre (BODC) announces the launch of the data management area for the UK Ocean Acidification (UKOA) research programme. UKOA is a five-year, £12 million research programme that began in 2010. 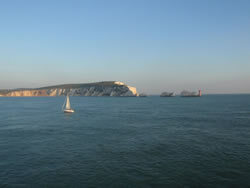 It involves 27 research institutes in the UK, has close links with other ocean acidification programmes around the world and is co-funded by the Natural Environment Research Council (NERC), the Department for Environment, Food and Rural Affairs (Defra) and the Department of Energy and Climate Change (DECC). Ocean acidification occurs as carbon dioxide (CO2) dissolves in seawater and forms carbonic acid. The oceans absorb roughly half of human CO2 emissions and, if we continue emitting CO2 at the same rate, the acidity (hydrogen ion concentration) of the upper ocean is predicted to increase by about 150% by 2100. This pH change has other important implications for ocean chemistry – and marine life. UKOA aims to better predict the chemical changes involved and their knock-on effects for organisms and ecosystems and thereby help provide effective policy advice on the potential size and timescale of risks. BODC's role involves the quality control, dissemination and stewardship of UKOA data, as well as facilitating data exchange within the UKOA community and providing advice on data management best practice. Our data management web pages provide background information about the UKOA programme, as well as inventories of research cruises and associated datasets. The pages are designed to promote data sharing and collaboration between programme participants and the wider scientific community. 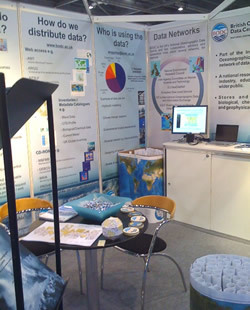 The British Oceanographic Data Centre (BODC) are participating in Oceanology International 2012 (Oi12). It takes place from 13-15 March 2012 at ExCeL London, the international exhibition and conference centre in the Docklands. Oceanology International is a global forum where industry, academia and government share knowledge and connect with the marine technology and ocean science community, looking to improve their strategies for measuring, exploiting, protecting and operating in the world's oceans. A huge selection of marine technology suppliers will be exhibiting their latest innovations and the event will also include a conference, visiting vessels and live demonstrations. There will also be a Careers Day, which should provide good opportunities for student outreach. As ever, BODC will have our own stand (it's L250 if you're looking for us) and we'll be demonstrating our current projects and developments. Here's the floorplan of the stands at Oi12, so come and visit us and pick up a BODC brochure, a free General Bathymetric Chart of the Oceans (GEBCO) poster (showing the GEBCO world map) and a BODC badge!